MX47 Series | Japan Aviation Electronics Industry, Ltd. The MX47 series utilizes a structure similar to the existing MX23A series waterproof connector, but is more compact while maintaining a low height. 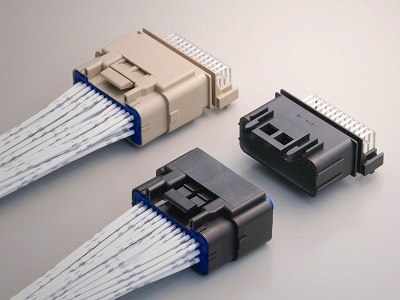 The applicable cable and performance is equivalent or higher than the MX23A, there is a guide key for secure mating, and pin terminals have Lead-free compliant complete plating. Superior vibration resistance makes the connector ideally suited for use in harsh environments such as the engine areas of both 2 and 4-wheeled vehicles. 2.5mm horizontal pitch, 3.6mm vertical pitch, 3-row board-to-wire connector. 39 positions. Available in different keying to prevent mis-mating when using two sets at once. Secure mating with guide key. Dowels on both sides of connector lightly press-fit to board for temporary holding. Socket terminal is a compact box type for strength against external force. Contact area uses a 2-layer spring structure for strength against twisting. Retainer is a simple structure front cap type which is easy to attach. Pin terminal press-fit structure prevents leakage of potting material from terminal area. Slim-type pin terminal with 0.5mm thickness and 1.0mm width, Lead-free compliant complete plating. Automotive waterproof units such as engines of 2 and 4-wheel vehicles, and general-purpose engines.